If you’ve been to any SDCC or are into nerdy podcasts, you’ve probably heard of Nerdist. Every year at San Diego Comic Con, there’s usually some large sponsored party, offsite event, or other fun thing with the Nerdist brand in tow. Showrunner and founder of the Nerdist Chris Hardwick is well known in pop culture media circles, though in Februrary he separated himself from the larger Nerdist Industries brand after his contract with parent company Legendary Entertainment expired. One thing I didn’t know was that the Nerdist brand had an affiliated comedy training center in Los Angeles, the Nerdist Improv School. Just a few days ago, in a move echoing Hardwick’s split from the Nerdist umbrella, the Nerdist Improv School announced a rebrand under new leadership as The Ruby LA. Rest assured, they will be remaining at the same address: 7518 Sunset Blvd. Very sad to see Meltdown Comics and NerdMelt go 🙁. Great memory from when I met @stevecardenaspr after my Nerdist Lvl 4 improv grad show. Got my brother @soratheking a signed Red Power Ranger Funko Pop for his birthday. His favorite ranger. The NerdMelt Showroom was also the first place I did standup at one of their open mics. And for those wondering about the improv and sketch teams… Nerdist School LIVES! Shows are still going to happen. More details of changes to come soon. Meltdown Comics was an LA institution with a history stretching 25 years and the sudden announcement of its closure in little more than a week was quite the shock, earning coverage in a variety of publications. The shop served as more than just a neighborhood comic book store, it was also a cultural epicenter, hosting the comedy theater NerdMelt Showroom and supporting many independent artists/writers. Some notable people have passed through NerdMelt, like Silicon Valley’s Kumail Nanjiani, Community creator Dan Harmon, comedian Louis C.K., writer Grant Morrison, and more. No business is easy, least of all one rooted in paper surrounded by brick and mortar, yet against all odds we survived just long enough to host, share, and celebrate some of the most creative and imaginative artists in the world. As I prepare to extinguish Sunset’s neon know that there is a new path for me (more later) and I close Meltdown without any regret. Gaston never spells out why Meltdown is closing, but the Nerdist blog speculated that the reason could have been planned luxury condo development in the area. Others are not so sure, with Curbed LA noting that the development is still waiting on a environmental impact report before being approved by the city and that nearby storefronts haven’t closed up yet. The letter points to difficulties competing as a comics retailer in the face of digital competitors, which could have meant financial struggles for the shop. Yet Gaston also mentions a new path opening. The Meltdown Comics website reinforces evidence for continuing the business, asking visitors to sign up for their email newsletter to find out “what the next 25 years will bring”. 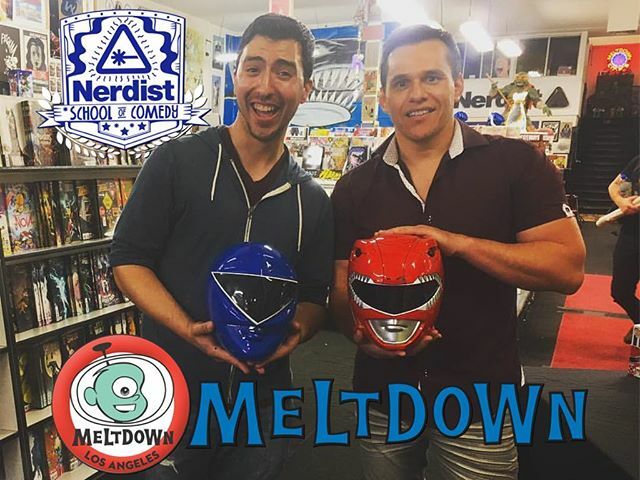 Was the closure of Meltdown the main catalyst spurring the rebrand of the Nerdist Improv School or was it just the final contributing factor? Rebranding and relaunching as The Ruby LA has been in the planning stages for several months now, and had nothing whatsoever to do with the closure of Meltdown Comics. Legendary owns the Nerdist brand. Neither Legendary nor Nerdist is affiliated with the improv school anymore.. We maintain a great relationship with them, they have been nothing but supportive of this rebrand, and we still maintain a positive relationship with their development and production teams. We wish we could say that being part of the Nerdist brand helped Nerdist School with marketing and promoting in more recent years. Unfortunately, that was not our experience, and our community recently felt more held back and limited, rather than boosted, by our relationship with Legendary/Nerdist. (Chris Hardwick, who originally began the Nerdist brand with his podcast many years ago, has also pivoted away from Nerdist, and has changed the name and branding of his podcast, etc.) We think Nerdist plans to maintain a presence in the blog world, but you’d have to ask them. 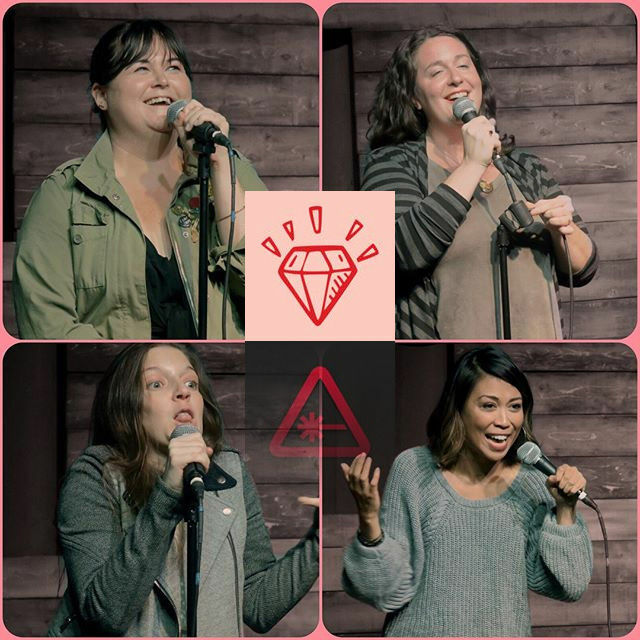 A Los Angeles comedy theater and school that is feminist and inclusive and run by women and POC in has been something the comedy community says it has needed and wanted for a long while, especially in the #MeToo era. We have found in the short time since we made this announcement that what we are doing speaks for itself, and we have found it to be relatively simple to market and promote this concept, especially because we are so passionate about it. We are doing something that has not yet been done, and we are blown away by the level of support, excitement, interest and the sheer number of offers to help us in any way possible. Our own community, and the greater Los Angeles comedy community, has been absolutely amazing, and has reflected back to us that this is something they want to be involved in. It’s been inspiring to see. We hope to use that excitement and that sense that we are doing something fresh, different and necessary, to approach marketing and promotion this year. The evidence of an internal split may just be circumstantial. We should also consider that many Nerdist faculty members have UCB backgrounds, have worked there, or still teach there so there is some overlap in the community. Still, the choice of one over another is interesting. A cursory search of Google shows a surprisingly small number of reviews and experience reports on the improv school, especially for a school associated with a large brand like The Nerdist. At their launch in 2015, they had received an exclusive with the The Hollywood Reporter, coverage in the LA Weekly, an article in the Nerdist blog, mentions in comedy industry news blogs, and an official nerdist.com/school URL on the main website. Remember that The Nerdist is a site that almost ranks in the top 100 in the news magazines and e-zines category according to SimilarWeb, with over 8.3 million visits a month. However, their Yelp profile, boasts only 12 reviews over the course of 3 years. Speaking from my personal experience working in digital marketing, a business that has been around for 3 years with large media mentions should have more reviews than that. Particularly in marketing a business using local search results, reviews are incredibly important to attracting customers. The Yelp profile is overall quite positive though, with an average rating of 4 stars. The number of reviews drops from 7 in the launch year of 2015, to 3 in 2016, to 1 review each in 2017 and 2018. The two last reviews also criticize the management of the school, citing issues with how customer issues were handled and the organization of the school’s processes. We at The Ruby would not respond to criticisms about the Nerdist School. We will certainly respond to criticisms about The Ruby when they arise, as they are likely to, as every theater receives criticism, but we can’t speak to the past with any authority about Nerdist School. At the forefront of what we are doing at The Ruby is creating a place for women and POC to perform, learn, thrive, and create community together. We will be working to improve on all the previous concerns relating to the Nerdist School, as we have a new leadership team in place, a new mission statement, new business plan, and new people at the top making the big decisions. We should also keep in mind the inherent bias of the online review system. The online reviews I mentioned could just be random people on the internet that have a vendetta against the school. A sample size of 1 review per year isn’t the most confidence boosting in the reliability of these results, after all, anyone can write anything online. It’s also just 3 critical reviews in 3 years for a school running multiple classes throughout the year. In addition, marketing research has shown customers suffering bad experiences are 52% more likely than those having good experiences to share a review online, so the data does show bias towards the negative. Competing schools Groundlings and United Citizens Brigade seem more well known, with reviews in the hundreds. To be fair, most of the reviews in each profile are not for their improv schools and Groundlings/UCB are considered monsters in popularity. Even well established theaters expanding from Chicago like Second City and iO West had difficulty in the LA market. iO West was closed earlier this year in Feburary, citing financial difficulties. Second City is still around, but judging from the number of reviews on their Yelp profile they remain a smaller competitor. Adding together the number of reviews for the Nerdist Improv School and its theater venue NerdMelt Showroom totals 51 reviews, compared to Groundling’s 277 reviews or UCB’s 544 reviews. Filtering specifically in the reviews for the word school, the two bigger schools seem to have failings of their own–crowded classes, diversity, and questionable teachers/instructor helpfulness. Long post! I’ve gone through all levels at Groundlings (2007-2011), UCB (2007-2012) and Nerdist (all in 2016) and, so far, Nerdist School has been my favorite program. The best thing I took away from their 4 levels of classes is the freedom (and confidence) to improvise from a more personal place. In levels 1 to 4, I was given the opportunity to learn a variety of tools (character/emotion, pattern/scene structure, organic/pure form, acting-focused play, etc) and then, at the beginning of the 4th level, I was literally asked “what do you think is funny/what do you like about improv/what is interesting to you about this scene” and we were given chances to make big and small moves that lit up our individual improviser brains and see what happened. You could pretty much do whatever your instincts inspired you to do, as the forms were mostly loose/organic, and it wasn’t an environment that assumed that an unexpected move was “wrong” because it wasn’t in tune with a specific philosophy. Sometimes the experiments and moves/scenes didn’t work but sometimes they did and it was super valuable to feel what it’s like to improvise successfully while following your ‘voice’. At the end of level 4, I had spent 8 weeks challenging my inner voice as an improviser instead of 8 weeks trying to fit my impulses/instincts into a school’s already-built model for how to play, if that makes sense. The irony is that I’ve actually gotten way better at playing ‘game’ since taking that level 4 class. Without the pressure of PLAYING GAME ALL THE TIME IN EVERY SCENE, I can relax and use game as a tool to make patterns and moves out of connections that my brain already made ‘organically’. In other words, it doesn’t feel like I’m suspending my own impulses as I try to figure out what the correct game move is. Long story long, what I gained was very personal and individualistic (I’m a stronger improviser when I perform with my indie teams). I can see that being unsatisfying as an answer when you want to know what a school is all about in 2 sentences. The school made me a better and much more thoughtful/sensitive improviser instead of making me a ‘Nerdist improviser’ and I’m super happy with that. That’s not the only post on that thread that’s positive and a forum thread on backstage.com also has some positive replies about the school’s quality. My question is why more of these aren’t visible on widely used local review sites? Los Angeles sure does have big name improv schools, although I personally find that’s not exactly what people are looking for anymore — a big name place. However, there aren’t any comedy schools or theaters which have been openly founded on the ideals of feminism and inclusion,. We are proudly stating from our inception that we are an inclusive and feminist organization, and intersectionality / intersectional feminism is the belief system through which we have created and are leading The Ruby LA. I was a bit curious, both about the Nerdist Improv School and its relaunch as The Ruby LA. Thus, I spoke with him about his own experiences going through the Nerdist Improv School program. Since he’s also a regular performer on one of their house teams he is very familiar with how the school operated and how it was to learn through their curriculum. In general, from my outsider’s perspective, I’d characterize him as a veteran of the whole improv scene in Los Angeles. He’s also done classes at Groundlings, UCB, and the Impro so he’s well versed in how the different schools do things. Steven first started his journey into improv over 6 years ago, but it was short-lived in the beginning. He’s really only gotten deeply into the community in the last 2.5 years. He told me that the schedule worked for him, with enough classes at different times and the value for what he got–all that he learned–was excellent. You may be wondering why he initially joined improv. I wondered the same thing and he told me that he had always been kind of attracted to the whole spontaneity of improv. He had been attracted by the big name of Chris Hardwick of The Nerdist–he was a nerd at heart. 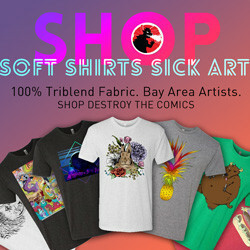 The ties to Meltdown Comics just sealed the deal. Beyond that, improv also was helpful to him professionally; as an actor it helped him to be more comfortable on stage, especially in being more confident when unprepared. As a writer–he was always into making films–it helped him learn how to be more economical and concise in his storytelling. Steven told me he had completed all 4 levels and some of the sketch writing related classes. For him, it took about 2 months to complete each level, with 8 classes per level and 1 class per week. Each level also ends with a capstone performance show separate from the classes and performed at the actual theater. He felt the classes had a great diversity in the teachers. Each teacher brought their own style and perspective in contrast to having one uniform “Nerdist School” teaching style that was reinforced in every class. If you’re looking for an answer like ucb is focused on game or iO (which I’m also a graduate of) is relationship you won’t find it because that’s not what the school is about. It’s very much focused on pure improv. It’s about you. Focusing on your emotions. Your abilities. Then how to mold that into a scene with others. Unlike ucb or iO there’s no signature form at nerdist. The Harold is the focus at iO from level two on. There’s no such thing at nerdist. The closest is pure form which is making a form up as you go so really. Just improv. It seems like you want a structured answer with this is what they focus on but that’s just not how this school is. Here’s an example of an exercise that I’ve taken groups through, that I’m pretty sure I learned from Ptolemy at some point (and I think jibes with his view of “freeform” or “pureform”). You take a suggestion of a physical object, and then perform a 25-minute set that has a structure based on that object. Nothing is discussed beforehand, you just have the understanding that the group is working towards a one-off structure inspired by the object. Suggestion is “orange”: Form starts with a group scene with everyone, subsequent scenes have smaller and smaller casts but get “juicier” which to my immediate hack mind means they get more melodramatic and (maybe) sexual. Maybe the show ends with a few “seed” scenes that are short, simple examinations of themes so far. Then one “seed” spills out into a new group scene with everyone and that’s the blackout. Suggestion is “spray bottle” (my cat is roaming our office): The show is a series of “squirts”… source scene to fill the “bottle”, and then quick dispersing scenelets inspired by that. Suggestion is “post-it note”: Start with a two-person scene… someone on the back line physically touches one of the players and endows them with an adjective, as if they were sticking a note on them. Throughout the show that specific form of character painting is used. Occasionally a sweep edit resets the entire show (tearing the post-it off) and we begin with a blank space. Also, for no particular reason, most of the imagined props, set, and clothing are bright yellow. Which may or may not lead to something. Then you do a lot of post-set discussion to see where people were thinking what, and how successfully the ideas were communicated. Beyond the improv skills, one of the most important things Steven learned was teamwork. He honed his ability to collaborate– to get involved with others–and connect with other people to get something big done. As an editor and writer, he had an easier time being mostly self reliant in his film ventures and so had a tendency not to delegate work. Improv was a good way to learn how to give up that control and work together with others for the benefit of a production. His favorite memory of his? The school auditions for the performance teams were one of the most memorable positive experiences for him. It was more like a party than an audition and that was something radically different from anything he had known before. A normal audition is pretty much a job interview, with all the nerve-wracking probing that process implies. In contrast, the Nerdist auditions had food, drinks, music and a convivial party atmosphere. Everyone was friendly and the only thing that made it an audition was everyone getting up on stage to perform. The teachers didn’t separate themselves off–they also got up together with the students to perform together. Steven confided to me that he actually thought “this is really fun,” and from there he became more involved in the workings of the school. Thank you so much for your interest in our classes! As we recently announced, we are undergoing a transition from The Nerdist School to The Ruby LA. We’ve put a temporary hold on class registrations on this page while we finalize the registration page on our new site. All of the classes listed below will still be proceeding as planned, so you can still check out the teacher bios and class dates. As I was wrapping up our conversation, I asked him if he had any tips for those he might want to join a class. He said to just come and have an open mind. There aren’t expectations that you have to be an actor, performer, or someone with experience. There are plenty of people attending classes who don’t come from a performing arts background with just a regular boring office job. You can also benefit from doing improv classes beyond learning improv skills because, at its core, it’s about learning to be a better communicator. You’re better able to deal with stressful situations, work with others, listen, and be confident in what you say. When life throws the unexpected at you, you better throw something back. 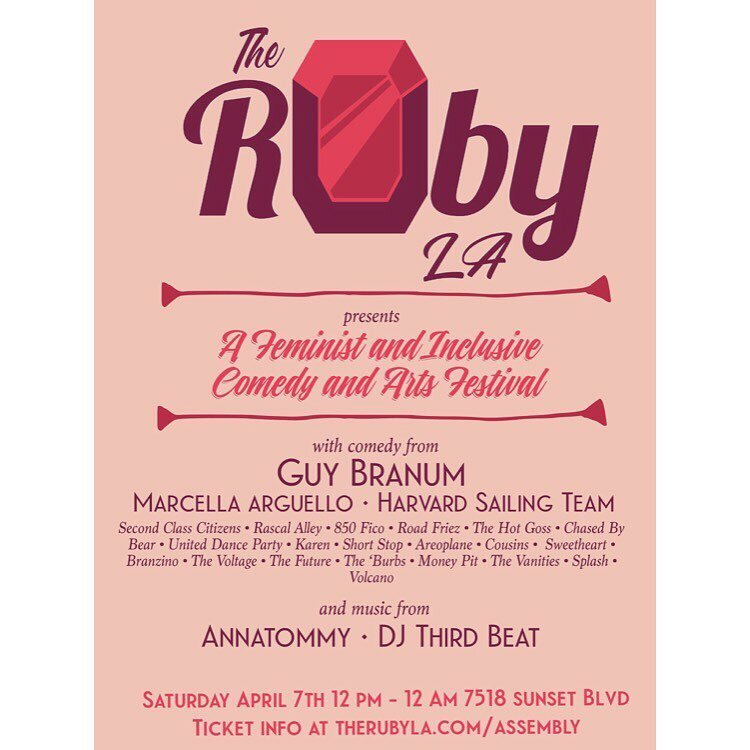 The Ruby’s co-founders, Barrow, Curran, and Thompson, are actors, comedians and writers in their own right; and join The Ruby LA from previous faculty and administrative positions at places like Nerdist School, UCB LA, The PIT NYC, and NYU Tisch. Faculty at The Ruby will include veteran comedians and creators in the industry, like Dwayne Colbert (Silicon Valley), Rebekka Johnson (G.L.O.W. ), Muriel Montgomery (Quick & Funny Musicals), Melissa Pryor (Big Little Lies), Ashley Ward (Baby Wants Candy), Patricia Villetto (Dreamworks TV), Bill Posley (G.L.O.W. ), Steph Garcia (The Catch), Ptolemy Slocum (Westworld), and more. The Ruby’s theater space is managed by comedian/producer Lauren Bancroft. Plans are also in the works for a feminist podcast network broadcasting from The Ruby under the direction of Samee Junio (Historical Roast), as well as a digital production arm featuring inclusive, female driven content.